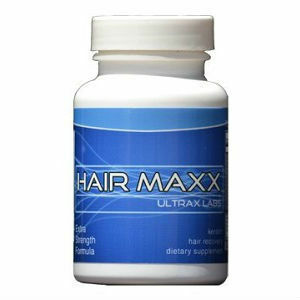 This is a review of Ultrax Labs Hair Maxx, now called Hair Rush. The makers claim this product increases thickness and growth of hair, while decreasing loss. It claims to be safe for men and women and should be used for at least ninety days before results are noticed. To learn more about Ultra Labs Hair Maxx Review and if it might be the right product for you, continue reading. The leading ingredients in Hair Rush are nettle leaf powder, pumpkin seed powder, saw palmetto, magnesium, vitamin B6, zinc, and biotin. Nettle leaf powder and saw palmetto help by blocking DHT. The pumpkin seed powder helps promote faster and healthier hair growth. Follicle boosting ingredients are vitamin B6, zinc, magnesium, and biotin. The recommended dose is two tablets each day. It is recommended to take with food to avoid upsetting your stomach. Some side effects include diarrhea, upset stomach, or vomiting. These effects usually end once the body has gotten accustomed to the product. If you are allergic to any of the ingredients this product contains you should not take Hair Rush. Allergic reactions are trouble breathing, rash, and dizziness, if any of these occur discontinue use and see your physician. The website sells Hair Rush for $59.99 for a bottle of thirty tablets, making it a half month’s supply. There are no shipping or handling charges. This product has no discounts, though it is available on other websites, so you may want to shop around for the best deal on this product. This product has an unbelievable 110% satisfaction or your money back guarantee. There are stipulations to this guarantee as three months worth of the product must be purchased at the same time and only from the product’s website. You must use the product between sixty and ninety days as this product takes several weeks before results can be noticed. If you do return the unused portion of the product within the time frame allowed, the company will add an additional 10% to your refund just for trying their product. This product offers 100% satisfaction your money back plus 10% guarantee. Research showed consumers who left feedback on the product’s website resulted in the majority of reviews to be favorable. Further research on other sites about Hair Rush gave similar results as a very high percentage gave rave reviews. This product though expensive had great results according to consumers. Negative reviews consisted mainly of seeing no results. Hair Rush from Ultrax Labs is priced on the high end of hair regrowth products at a cost of close to $120.00 a month. No information was found on where the product is made. Due to the high price, we recommend looking for a different hair growth supplement. John Brownstone	reviewed Ultrax Labs Hair Maxx	on August 3rd	 and gave it a rating of 4.